One of the things that I love about interviewing chefs is that each seems to have their own unique passion. Some are technical chefs and celebrate how the ingredients are prepared. Others have a passion outside of the kitchen and see their newfound celebrity as a way to bring attention to a cause that they care deeply about. Still others have developed a special skill, like charcuterie or reviving heirloom ingredients that has brought them much recognition. 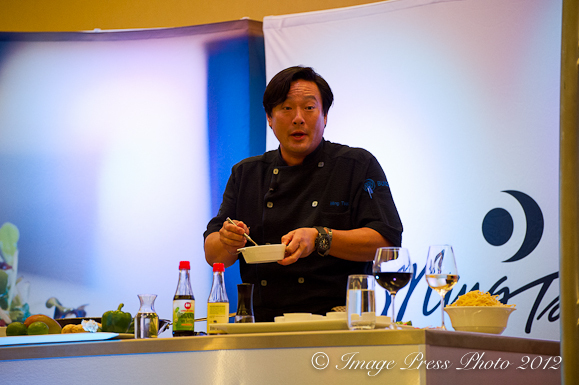 A few months ago, I was invited to meet Chef Ming Tsai while he was participating in the Food and Wine Buick Discovery Tour in Atlanta. Ming, as he prefers to be called, has had a long and very successful career. As I prepared for the interview, I wondered where the conversation would go since Ming has such a diverse and recognized background, beginning with his training alongside some of the world’s best chefs including Pierre Herme in Paris and sushi master Kobayashi in Osaka. Since opening his restaurant, Blue Ginger in Wellesley, Massachusetts in 1998, he has achieved an impressive list of awards and accolades, written four cookbooks and hosted three television shows. His awards include Best New Restaurant from the James Beard Foundation in 1998 and the honor of being the Foundations’ Best Chef Northeast in 2002. His current TV show, Simply Ming, is nominated for a James Beard Broadcast Media award this year. You can read more about Ming in his biography. Ming also mentioned the importance of certain foods in our diets, including Maitake Mushrooms, which are known as a super food in China. In China they are considered to be an “immunity enhancer”. High in antioxidants, important in maintaining a healthy heart, Maitake Mushrooms are also known to fight cancer. Ming told us there was “something very cool coming down the pike”. He now has a Maitake Ground Coffee Blend that is available on his website. He firmly believes in the preventative and healing benefits of these mushrooms. Love this interview, Gwen!! So happy for you that you got to meet Ming and interview him…and Mr. B getting to golf with him!! Very exciting. Ming is such a great example of a great chef, great businessperson as well as seems to me all-around good person. 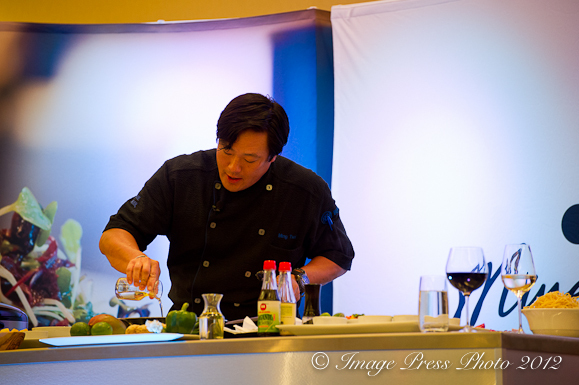 He’s definitely someone I look up to…when I was growing up, there weren’t many Asian-American chefs to look up to. Congrats, again, Gwen! Love your chef interview series! Thank you for the comment. I agree with everything you said about Ming. He was a pleasure to meet. He is incredibly talented and definitely an inspiration to others. I know Mr. B had a great time golfing with him in Atlanta. That’s wonderful that you got the chance to meet Ming. He seems so warm and easy going. I’m sorry to say that I haven’t been to Blue Ginger yet. Despite being fairly close, it’s far enough away to make it a bit of a challenge to get to. If you come, maybe that’s where we’ll go, since we’ve been dying to try it. I too love his awareness to allergies, as my sister is highly allergic to nuts and it’s so hard for her to go out for any Asian cuisine. Yes, Blue Ginger would be a great choice when we get to Boston (I hope this year!). If anyone has an allergy of any kind, Ming’s restaurant would be one of the best choices. He is obviously committed to making sure that everyone with any kind of allergy is safe when dining at Blue Ginger. Finally a chili recipe!!!! What are fermented black beans? I was thinking of you when I made and decided to include this recipe! Here is a video from Ming on fermented black beans. http://www.youtube.com/watch?v=4tiZQCntfh0 I have an Asian market a few blocks from my house, but if you don’t, this will tell you what they are and how you might find them. I would love to try this recipe! I love that it’s vegetarian, and healthy! I’m always looking for delicious healthy recipes. I had the pleasure of meeting Ming a couple of years ago when my hubby was nominated for an Emmy for the music he wrote for Today Show. Ming was a presenter at those awards. He was so gracious (and so handsome!!! He rocked that tux!). Truly a nice guy. How exciting! I am thrilled about your husband’s Emmy nomination. How did he do? I am also glad you were able to meet Ming. Yes, he is very gracious and a real pleasure to speak with. 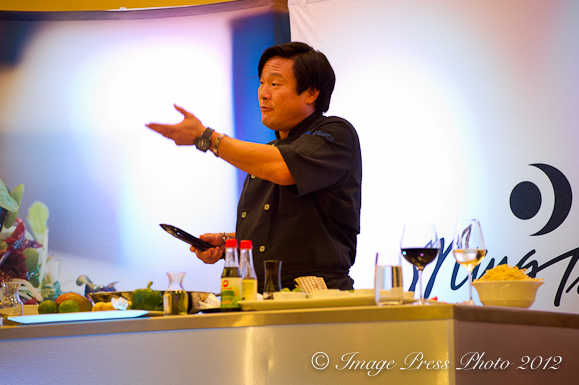 LOVE Ming Tsai..what a marvelous chef and an equally talented chef! I had the pleasure of meeting him at his great restaurant Blue Ginger! I hope that we can get to Blue Ginger later this year. We keep trying to make it to Boston and can’t seem to find the time to make the trip. So glad Ming was there when you went and that you had a chance to meet them. He says he is in the restaurant about 2/3 of the time when he isn’t traveling, etc. Another great blog post, Gwen. 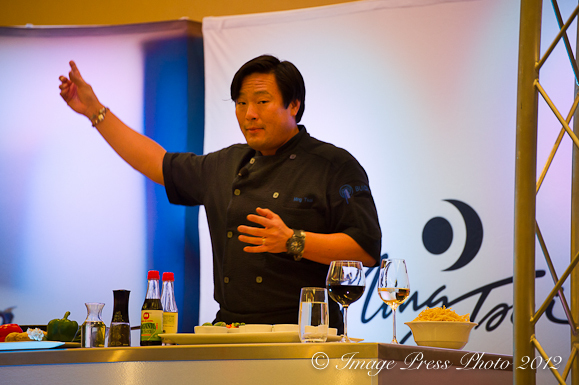 Ming Tsai is a wonderful person. I serve on the board of a local domestic violence organization, Ming and his wife Polly were ‘celebrity guests’ at a fundraising dinner at our home a couple of years ago. Both are equally engaging, entertaining, and warm individuals. Truly gracious. We recently ate at Blue Ginger, and I was reminded why it’s such a huge success. Thank you so much for your comment. I am glad that you were able to meet Ming and his wife. I know that he is involved in a number of charities and that he enjoys supporting them as much as possible. Roger and I are hoping to get to Boston later in the year. Maybe we can all meet at Blue Ginger if we make it! I totally agree with you. There are some recipes that just work and some chefs that have perfect recipes. Every one of the recipes I made from Ming’s book was excellent. This chili recipe was definitely one of them and I cannot wait to work my way through this cookbook. I had a guest instructor in my baking class one day who used to work for Ming. He owns a restaurant in Jacksonville called Blue Bamboo which Ming had a hand in naming. It was such a great experience, and I learned so much in class in that one short day. Made me wish I could learn from Ming myself! I would imagine that anyone that worked or trained with Ming would have an excellent background. I also agree that a class or two with Ming would be incredible. Maybe we should look into that!